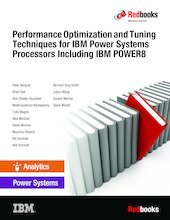 This IBM® Redbooks® publication focuses on gathering the correct technical information, and laying out simple guidance for optimizing code performance on IBM POWER8® processor-based systems that run the IBM AIX®, IBM i, or Linux operating systems. There is straightforward performance optimization that can be performed with a minimum of effort and without extensive previous experience or in-depth knowledge. The POWER8 processor contains many new and important performance features, such as support for eight hardware threads in each core and support for transactional memory. The POWER8 processor is a strict superset of the IBM POWER7+™ processor, and so all of the performance features of the POWER7+ processor, such as multiple page sizes, also appear in the POWER8 processor. Much of the technical information and guidance for optimizing performance on POWER8 processors that is presented in this guide also applies to POWER7+ and earlier processors, except where the guide explicitly indicates that a feature is new in the POWER8 processor. This guide strives to focus on optimizations that tend to be positive across a broad set of IBM POWER® processor chips and systems. Specific guidance is given for the POWER8 processor; however, the general guidance is applicable to the IBM POWER7+, IBM POWER7®, IBM POWER6®, IBM POWER5, and even to earlier processors. This guide is directed at personnel who are responsible for performing migration and implementation activities on POWER8 processor-based systems. This includes system administrators, system architects, network administrators, information architects, and database administrators (DBAs).